Words are emotions. Threading together proper nouns, verbs, adverbs, and adjectives, one can evoke and jar the reader’s consciousness. This collection of work is like a series of buttons that activate a sense. Smell, taste, touch, sound, and sight are engaged. Each tale is a condensed journey through the gambit of sensations to maximize your feelings of love, hatred, anger, and betrayal. A common thread of loss weaves through the pages. Words that harken past images, blend shadows, hauntings, memories, ghosts, and eras have gone by, seasoned with gothic aplomb. These are not readings from the present but hewn from a distant bygone that all of us share. 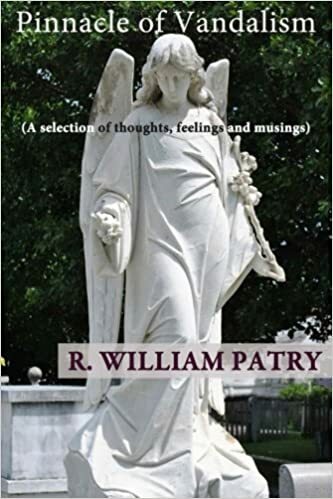 In this book, the reader will have a sense of fear, dismay, ecstasy, and indignation by what he reads. As the ferryman Charon guides his passengers along the dark river Styx to Dante’s Inferno, so shall you be guided through a tapestry of human emotion. Buy Pinnacles of Vandalism today.